few links to sites that are important to us. We hope that you will find them as valuable as we have. We have been asked on a number of occasions if our collars and leashes are a good choice for training a dog. First let me say, we believe that obedience classes are a great idea for you and your dog. 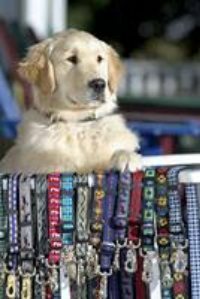 And we know that there are so many different collars, harnesses, head halters, and other devises out there that may be good choices for you when you take your pup to doggie obedience school. As a dog trainer, I use all kinds of different equipment when I am training my dogs. Your instructor can help you with the best choice. With that said, there is one trick that I try to pass on to all my students.... Try using different equipment for different purposes. I use a leather martingale collar on my dog when I am looking for heeling nicely right at my side, and I use a flexi lead when the walk is all about doggie time to sniff and explore. My dogs know the difference and respond appropriately when I put on each different type of equipment. So listen to your instructors and use the appropriate training equipment for your dog when you are going to dog school. And when you are home and it's time for your dog to just be a dog... it's time for his everyday Yellow Snow collar and leash! Reflective and glow in the dark are two different things. Reflective materials will bounce light when it shines on them. Our reflective patterns have silver in them that becomes bright and reflects light when a light source shines on it. You don't always notice it in the daylight, but at night when car lights hit the collar or spotlights on your house or a flashlight, you will see it. We have not found a glow in the dark material that we are happy with so we don't offer a glow in the dark product. A glow in the dark product would collect from a light source during the day, and glow at night. It would not need a light source at night to glow. Whatever you decide to do with your dog at night, be safe !!! Start with your leash adjusted to approx. 4 feet. Your leash should be double width from the handle to the metal snap (the part you attach to the dog). Hold the plastic piece that sits between the handle and the leash in your left hand between your thumb and fore finger. Let the leash drop naturally with the leash falling to the right and the handle falling to the left. Take the "strap keeper" (the small plastic piece that holds the two straps of your leash together) and push it all the way to the bottom of your lead so it is as close to the metal snap as it can be. Take a hold of the front piece of webbing in your right hand and pull downward. This motion will pull the webbing through the adjustment system you are holding with your left hand, eventually leaving no webbing in the back and all the webbing in the front. This motion will also make the metal snap rise so it is right up next to your handle (if you have the Super Bungee Leash this will bring the bungee part of your leash up next to the handle. You will not be able to go as far as the metal snap with a Super Bungee Leash). Your snap is now positioned to make a short leash. The webbing that you have pulled through the adjustment system may be snapped up in the plastic snap located in your handle so it is out of your way. PLEASE NOTE: While our leashes can be adjusted and used at a short length, they are most effectively used at a 4 - 6 feet. If you are looking for long term use of a short leash, we suggest our Heeling / Traffic Leash which is a shorter version of the Sports Doggie Leash. People ask me all the time if they need to have the 1" wide leash for their big strong dog. The answer is no. Choosing between a 1" wide leash and 3/4" wide leash is more a matter of preference than a matter of leash strength. Some people prefer the feeling of a heavier leash in their hands. For me personally, I prefer the lighter weight leash. I use the 3/4" lead on my big dogs and never concern myself that the dogs will be so strong that the leash will break. The 3/4" leash is strong enough to handle almost any dog. So pick your leash based on what you like.... based on what "feels" the best to you.... based on what is easiest for you to handle..... based on which snap you prefer. Don't worry about your dog being so strong that you need one leash over the other. We make two feature packed leashes.... So what is the difference? And which one should you choose? Both leashes have our padded handle that snaps open for easy tie up. 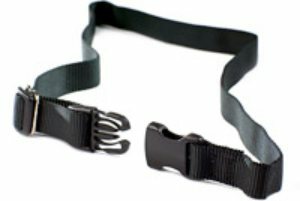 Both are adjustable in length, and both come with our heavy duty parts, webbing, and a full guarantee. Our Super Bungee Leash comes with one additional feature. 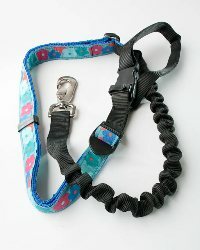 It is equipped with a section of bungee at the bottom of the leash, near the snap. So why would anyone pick that over the regular adjustable leash without the bungee? Well it's a matter of preference. Some people spend a great deal of time in dog school teaching their dogs to walk nicely on leash. We applaud that effort and for them, the bungee doesn't make any sense. Other people have not been able to fit doggie school into their busy schedules or they just have a dog that likes to pull (attention all huskies!) In that case, the bungee at the end of the leash serves as a bit of a shock absorber and helps ease the discomfort (for both dog and owner) from pulling. Hands Off Dog Walking - It is Possible! Several years back, we had someone ask us if there was any way we could make a leash that had a handle that would fit around their waist so they could do hands free jogging with their dog. That got us to thinking.... Having your dog or puppy tethered to you (in some situations) could be very useful. With proper training, dogs that walk nicely on leash do well on tethers. And that can make for nice walking, hiking, or jogging for their owners. There are some trainers that feel that tethers can work well with puppies. Tethering a puppy to you while you sit at your desk or eat your dinner can enable you to have your puppy near and yet under control. So we created our Handle Extenders. These are adjustable lengths of black nylon webbing that will buckle right into your Yellow Snow leash handle. Why Have More Than 1 Leash? Why have more than one leash? I have always had more than one leash.... Even before I made leashes! It's nice to have a spare leash in the car. And depending on the size or setup of your house, it can be useful to have a leash by the front door and one by the back door. I keep my old ratty leashes in the garage so I can grab them on rainy days or for walks where they might get dirty. And of course it's always good to have a spare leash in case you lose one... My spares are my older leashes so my girls can get all dressed up in their nice matching sets when we go out on the town! Different leashes for different jobs! Our leashes are great for walks and for all around daily use. I love that I can adjust the length and I love that I can get a shorter version (Heeling Lead) that is nice when I'm walking my dogs in town and want them to stay close to me. I love the snap in the handle for easy tie ups and as an all around leash, they are great. I also use a lightweight leather leash for training. I like the light snaps and the leather is small and not very bulky. I keep several lengths on hand, and they easily roll up and fit in my pocket. For working on heeling or loose leash walking I like that the snap is light in weight and therefore isn't creating much pressure on the collar. I use the cheapest or oldest leash I can find for puppies. Most puppies chew and it is a process to teach them that the leash is not a chew toy. Until I have done that, I don't use any leashes that I care about. I also occasionally use a flexi lead. I use them when I need to give my dog some freedom to go potty but also need them on leash. I also use them occasionally for training. I never use a flexi lead out in public where there are other people or dogs that might get tangled in my leash. There are all kinds of interesting leashes out there! Do yourself a favor.... Indulge in special leashes to do special jobs! Visit our other business, Telling Tails Training Center. Located in Fryeburg, Maine they offer positive training techniques that will enhance the dog and human relationship. They provide a wide variety of classes, seminars, clinics, and events to better serve people interested in enjoying time with and exploring new activities with their dogs. Classes will be taught by a variety of qualified instructors from the Mt. Washington Valley and from outside the Valley. Tired of replacing your dog's tags on a regular basis? 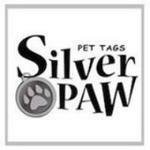 Silver Paw Pet Tags, home of the most durable, unique, and original stainless steel pet id tags made in the USA! If you have been searching for a beautiful pet id tag that not only looks fantastic, but stays looking fantastic, search no more! Tags have a lifetime guarantee and come in 3 sizes. Click here to order from our website!